Dozens of residents of Yemeni’s capital avoided likely injuries or death after a bomb, thought to be dropped by the Saudi-led coalition, fell into a residential block but failed to explode. A witness told RT the strike targeted a civilian-only area. Only a day after the brief “humanitarian ceasefire” ended in Yemen, residents of a densely populated neighborhood in central Sanaa barely escaped death as a huge 1.5-meter shell came crashing through the ceiling of an apartment, shattering walls and furniture. Terrified locals rushed to the house to examine the scene after the shell apparently failed to detonate. Surreal pictures of a bomb lying almost intact on what could have been a sofa were posted by witnesses on Twitter. RT contacted a witness called Hussein Al-Bukhiti, who said the shell landed in an apartment block close to where he lives while it was full of people. “It’s a totally civilian neighborhood, there isn’t any army [facilities] or anti-aircraft guns in that area,” Al-Bukhiti stressed, saying that if the bomb had exploded, there would have been “hundreds” of casualties, mostly women and children. There are no bomb shelters in the area, so the only place Yemeni civilians can seek shelter during air raids are their homes, Al-Bukhiti explained. The incident took place amid renewed air raids against the Shiite Houthi rebels launched by Saudi Arabia and its allies in Yemen, and has been blamed on the coalition by the locals. According to Al-Bukhiti, “the Saudi aggression is targeting all the country despite the fact there’re 25 million people living in Yemen… You can tell from the high number of casualties among civilians that they’re attacking everything in Yemen.” He described the incessant strikes that have been shaking Sanaa “every day, if not every hour” since March 26, except for the period of the recent five-day ceasefire. However, he added that the coalition did not heed the ceasefire elsewhere, with the northern Saada province, a Houthi stronghold, coming under fire daily. The strikes resumed despite a UN plea to extend the ceasefire for further delivery of food, fuel and medicine to the devastated regions of Yemen. Hundreds fled the worst affected districts of Sanaa, while coalition warplanes pummeled rebel-held military depots and positions. Airstrikes also targeted the southern city of Aden, where forces loyal to the ousted president Abd-Rabbu Mansour Hadi have been fighting with the Houthis and loyalists of the former strongman Ali Abdullah Saleh. According to UN humanitarian agency UNHCR, 1,849 people had been killed and 7,394 others had been injured in the Yemeni conflict as of May 15. With Saudi Arabia training anti-Houthi fighters on the Yemeni border, despite promising a commitment to a diplomatic solution to the crisis and UN-brokered talks, Sanaa residents fear the worst-case scenario of street battles and complete devastation will soon be upon them. 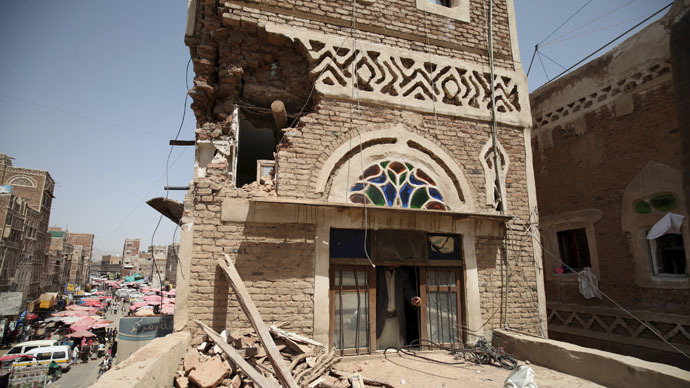 “Soon Sanaa will be like Aden and Taiz…There has been a big build-up since before the ceasefire and I think now there will be a big fight,”a tribesman from the central province of Ibb told the Financial Times. Reports suggest that a conservative Sunni military leader, Major General Ali Mohsen Al-Ahmar, has become a major figure in the Saudi-sponsored anti-Houthi force. Al-Ahmar, who is referred to as an Islamist, is believed to have been a chief orchestrator in planning the military campaign in Yemen, raising concerns that Islamists would take over the power in the Gulf country, should the ground operation against the Houthis prove to be successful.